The paper and pulp industry uses a variety of surfactants and defoamers at various stages of the manufacturing and treatment process. IGLs range of products addresses almost every stage while promising customer-specific variants of consistent quality. These are used in defoamers which find application in pulping, brown stock washing, paper machines and coating effluent treatment plants. These are used in felt washing and conditioning and de-inking chemicals and cooking aid, among others. These can be made to suit customer-specific requirements. Guar gum products are used to increase strength, burst factor, folding endurance, etc. It is also used as a retention aid for fillers. 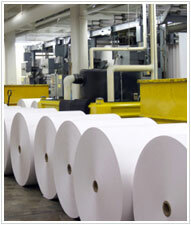 Synthetic strength-improving chemicals include DSR (cationic) and WSR (for tissue paper).